‘Les Fleurs Du Mal’ remains unapologetically difficult to engage with. When a band is hell-bent on following their own stylistic whimsies and instincts no matter where they lead, there often comes a point where the difference between what they want to play and what their fans would like to listen to, begins to part. With ‘Les Fleurs Du Mal’, which is sung almost entirely in French, Therion may well be about to begin a long journey down that path. Talk of art projects, operas and stage shows herald in a new direction from this innovative and uncompromising outfit best known for their head-on collision of bristling metal riffs, operatic vocals and classical arrangements. However after an absence of only two years, the change of focus and delivery is quite stark between 2010 offering ‘Sitra Ahra’ and ‘Les Fleurs Du Mal’ – an album inspired by the writings of French poet Charles Baudelaire, who had much of his work banned long beyond his own lifetime. Instead of huge bombastic choirs, operas and orchestras, ‘LFDM’ instead uses a collection of traditional French songs as the album’s base; giving the likes of ‘Mon Amour, Mon Ami’ and ‘La Licorne D’or’ a fresh twist, while still serving up an almost traditional folk vibe. It isn’t folk-metal, in fact I suppose it is still closer to symphonic, what with singers Lori Lewis and Thomas Vikstrom stretching out and hitting the stratosphere. However the whole album feels far less grand or bombastic than Therion’s previous work, instead providing a claustrophobic air that can become overbearing and tiring. Introductory track ‘Poupee De Cire, Poupee De Son’ illustrates the style at its best, with staccato riffs and stunningly arranged vocals making a strong impression, although one far less chest beating and uncompromising than Therion have become known for. From there ‘Wahala Manitou’ tones down the guitars, using harmonised vocals to make its point, while ‘Polinichelle’ utilises a scurrying guitar line to lead varying vocal lines down many a different path. However this is an album that you really have to work hard with to try to understand, and not just lyrically, with the guitars often taking a back seat to stripped back themes and vocal interplay. What makes the lock harder to unpick is the similarity in slow trudging pace from song to song, with the tracks all shuffling in and out of sight in two or three minutes excursions, without really having enough individuality or length to make a lasting impact. 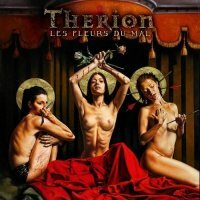 As ever with Therion everything is beautifully crafted, stunningly presented, perfectly produced and painstakingly pieced together, however in the end ‘Les Fleurs Du Mal’ remains unapologetically difficult to engage with. Whether Therion fans see this album as the beginning of a long and rewarding chapter for the band only time will tell. On the strength of ‘Les Fleurs Du Mal’, it could genuinely go either way, although with the band’s label Nuclear Blast opting out of involvement in this release, it would be fair to suggest some people have already made their minds up.